Did you hear about those toxic pumpkins? Don’t get me wrong, I love the internet for creating connections, running my businesses, and meeting so many amazing, like-minded people. But this big, wide, tangled web is also the perfect medium for spreading urban legends, wild-eyed rumors, and just plain ridiculousness. And sadly, even though they’ve been warned not to, most people believe everything they read on the internet. It’s a bummer. And those darn toxic pumpkins. 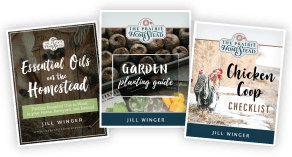 When it comes to myths pertaining to modern homesteading, I tend to hear quite a few. 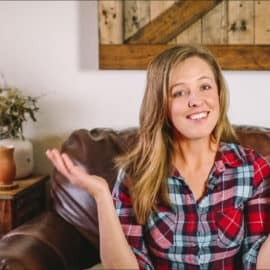 While many of these myths aren’t near as outlandish as those flesh-eating bacteria bananas, they still float around and often prevent many hopeful folks from grabbing hold of their homesteading dreams. If you’ve followed me for very long, then you know I’m all about encouraging folks to chase their dreams like crazy. Therefore, let the myth-smashing commence! 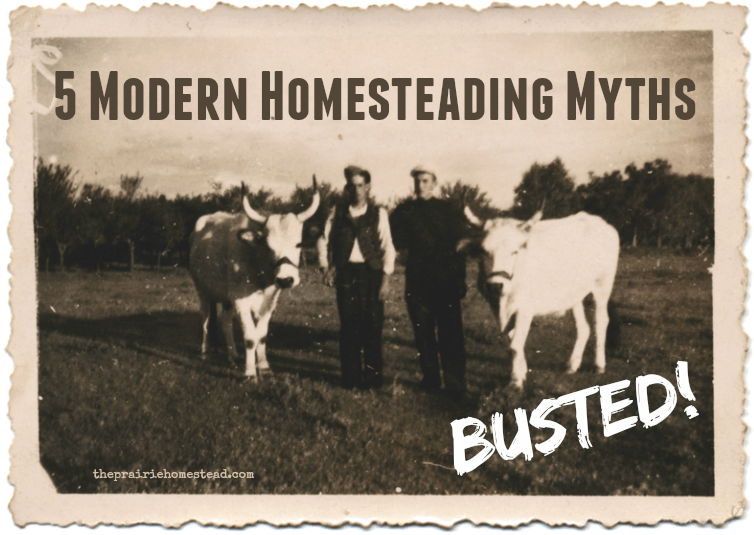 5 Modern Homesteading Myths: BUSTED! 1. 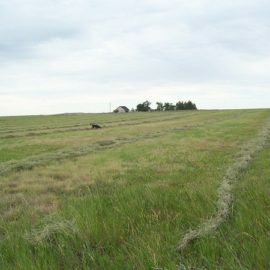 You can only be a homesteader if you start out with free land. I sure wish we had swiped up some free land, but alas, we have a mortgage just like anyone else. In 1862, Congress passed The Homestead Act which gave 160 acres (or more) to anyone who was willing to move West, build a dwelling, plow the land, and live on it for at least five years. As of 1976, the Homestead Act is over. Done. Finished. No more free land for us. So technically, that definition of homesteading expired several decades ago. However. A new group of adventurous people (that’s us!) have adopted the title. And that’s where this new breed of modern-homesteaders comes into play. You still need the same pioneering spirit and crazy work ethic, but you do have to purchase your land, instead of getting it for free. 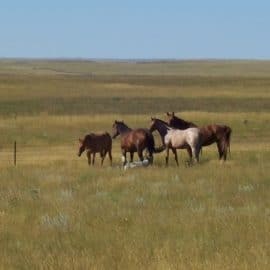 Would my personal homesteading journey have been easier if I had come from a big ranching or farming heritage? Maybe. Or maybe not… When I was younger, I used to wish like crazy I had been born into a rural-dwelling family, and I was pretty bummed when I instead found myself growing up in a small housing development on a 1/4 acre lot. But you know what? It hasn’t mattered. If anything, the delayed gratification caused me to pushed toward this homesteading lifestyle even harder, with more determination. I wanted it so bad I couldn’t stand it. My fascination bordered on obsession which worked in my favor. And I’ve done just fine learning many of these skills later in life anyway. 3. You’re going to have to turn into a hippie if you want to be one of those homesteader people. 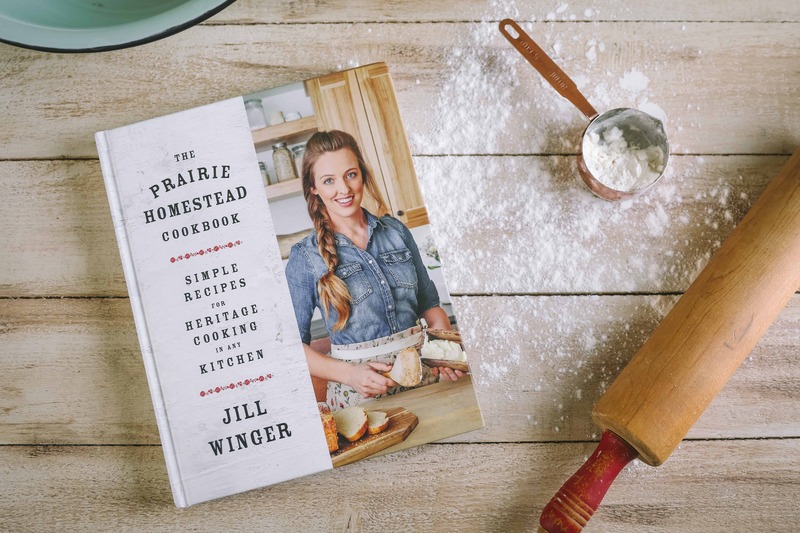 Well, if you want to be a hippie-homesteader, that’s perfectly acceptable. However, it’s not a requirement to join the modern-homesteading club. That’s one of the things I love the most about this homestead culture– you’ll find people from all walks of life and all political persuasions; we’re a pretty diverse bunch. I know homesteaders who have dreadlocks and wear tie-dye. I know others who wear boots and Wranglers. And they can all hang out and enjoy each other while they talk about who just finished canning what, and who’s taking the milk-cow plunge. It’s pretty awesome when you think about it. 4. If you’re gonna homestead, then you have to be completely off-grid, and grow every bit of food you eat from your land. I’ll be the first to admit: I love my dishwasher. And washing my machine. Amen? Could I live without them? Sure. But right now I don’t have to. And I appreciate that. Besides, if Ma Ingalls could have fit a washing machine in her log cabin, I’m pretty sure she would have. 5. 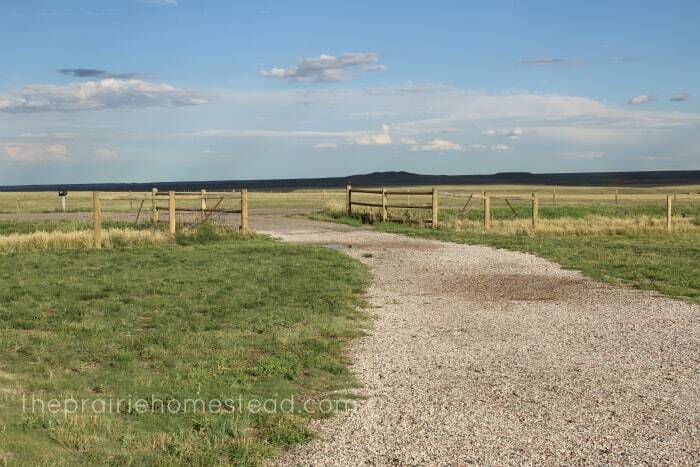 If you want to be a homesteader, you need a LOT of land. You can homestead where you are at RIGHT NOW. You do NOT have to live in the country, own bunches of land, or have a milk cow to be a modern-homesteader. Isn’t that awesome? I wanna scream it from the rooftops! You can learn SO many skills and develop so much knowledge where you are right now. I’m talking to ALL of you: the apartment dwellers, the soccer moms, and the folks who live in the heart of the city. It’s possible. It’s doable. And it’s so darn rewarding you won’t even believe it. In my opinion, homesteading is a mentality. A set of values. A skill set that includes the ability to sweat, work hard, get dirt under your fingernails, and appreciate the simpler things in life. And guess what? you don’t even need to own a square foot of land to rock that mentality. So there you have it– Mythbusters: Homestead Edition. 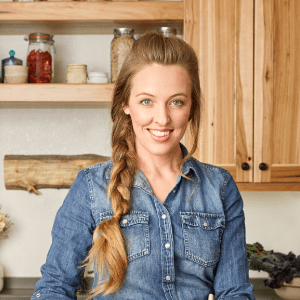 What are some homestead myths you’ve encountered? 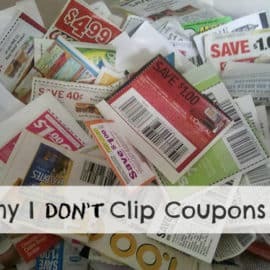 How We Homestead on One Income (Part Two) The BIGGEST Homestead Mistakes We’ve Made (so far) Why I Don’t Clip Coupons It All Started with a Compost Pile…. I am always amused by the reaction I get when people learn my “homestead” is 3/4 of an acre…in a subdivision. 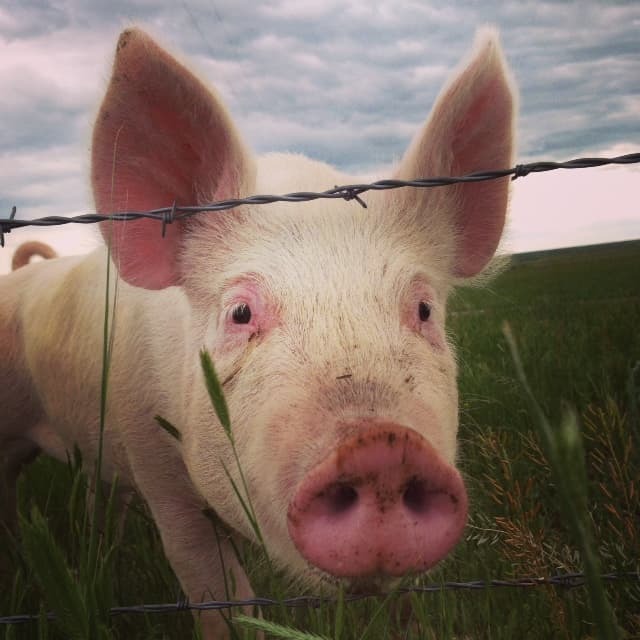 I grow my livestocks’ feed, 80% of our food, we use very little electricity, and I have over 100 chickens, 9 ducks, 10 meat and dairy goats, and 9 meat rabbits we use for breeding. We are looking into pigs next spring, as well as a few more ducks! I started with 5 chickens and a 10×10 garden and I grew so many tomatoes that first year that I was knocking on my neighbors’ doors and BEGGING them to take 20 lb bags of the things. I hadn’t gotten into canning yet at that point, but even if I had been I would have NEVER been able to put up so many. THAT’S what I’m talkin’ about Kelsey– you are inspiring!! What I’m saying in this comment, I was not smart enough to figure out for myself. I learned from watching Japanese women grow a large portion of their family food requirments while living in small apartments in Tokoyo. It is truly encouraging at the amount of food a person can grow on just one square foot. They grew all sorts of ‘microgreens’ and all sorts of leafty veggies. They had more than a square foot but a lot of them had only 20 square feet on the balcony and they did a heck of a job at feeding the family. They grew potted veggies, without sunlamps, in their apartments too. We took their knowledge and transplanted to a 20 by 40 foot backyard and never, repeat never go hungry for any garden variety veggie. Only one in a hundred people can make the move to ‘country’ but take hope city dwellers, you can survive right where you are if you will just take what you have, let your imaginatin run wild and start putting a seed into every square inch you can find. thanks and God bless. This is a wonderful post. 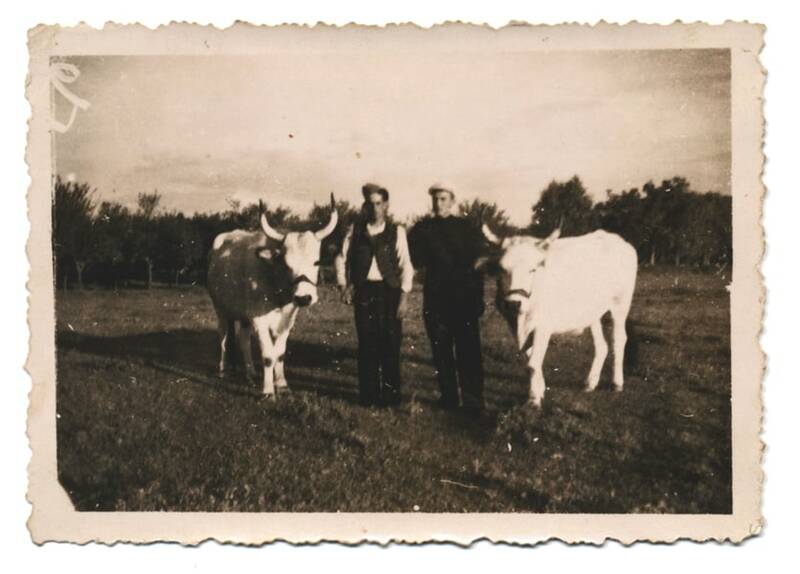 Prior to having 15 acres of land we were homesteaders in a very small apartment. It’s actually surprising how much can be done in such little space! P.S. 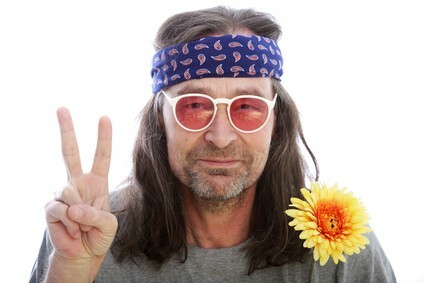 The picture of the hippie man is awesome! It made me laugh. I can’t tell you how many times I have been called a hippie! I love that you did the apartment homesteading thing first! I love this! 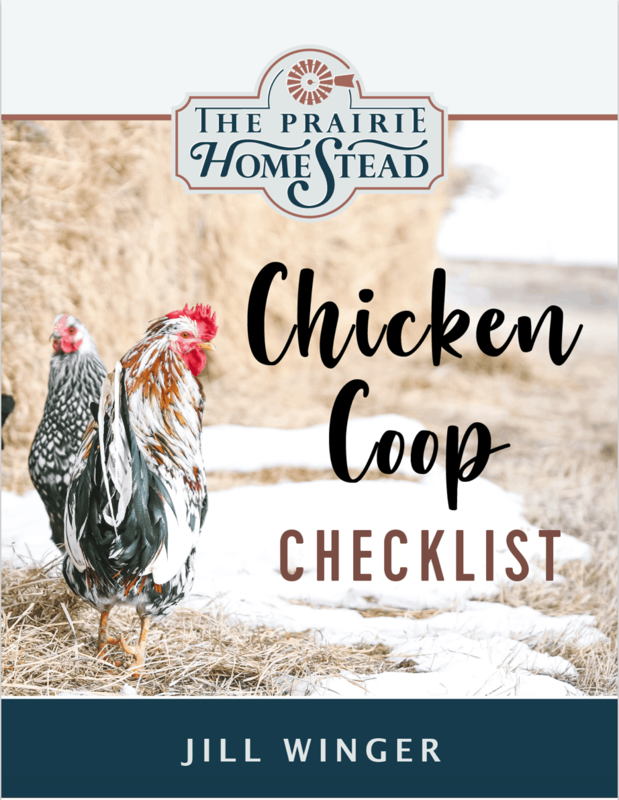 My husband and I are about to take the leap into homesteading after doing it small scale with a handful of chickens and small gardens over the past several years. We now have just shy of a 100 acres and EVERYBODY assumes that it was passed down from a relative, and has a hard time grasping that we bought it. I can’t wait to join your ranks!! This is very ironic because we WERE one of the ones to have benefited from the Homestead Act when my husband’s grandparents acquired the land we reside on now. I fought the homesteading thing for years and have just recently embraced it (again, with the irony). We have a hundred year old barn, old milkhouse and enough spaghetti squash to feed a small nation. The only other myth I would add that “Homesteading Is So Romantic”. Yeah, when you are in 95 degree heat, fixing the fence the bull broke through on the 4th of July when you are supposed to be at a really fun bbq, not so romantic. This cracked me up. My husband loves my hair long, but this past summer I told him I didn’t care how hideous he found me, long beautiful hair is for beautiful people who DON’T shave rescued, feral goats in 100+ degree weather. That being said, the most romantic thing I have received recently has been rubber boots. Yes, yes, YES Carey! The romance is few and far between! I couldn’t agree more Valerie! I just found your site. I LOVE it already. This post in particular really kinda hits home with me. I have just over 1 acre or land. I have had a garden for many years after I swore it off in my youth b/c my dad worked me half to death picking green beans. (I swear he never knew when to quit planting them). However, After a few years here, I decided I really like the idea of turning this place into a small homestead. It is really a bit of a long term plan for something to do, as well as supplemental income when I eventually retire. I raise rabbits, goats, chickens and Australian Shepherds. Of course a fairly large garden for veggies and even an orchard and also doing some “food-scaping” of various fruit trees and bushes. It is awesome to see others on this same type of journey. I love that you are returning to your roots Rob– Thanks for reading! I am interested in doing the homestead short of lifestyle at my current home but have ambitions of starting a community in my urban city and found this article and links very helpful. The only point of contention that I have is your definition of traditional homesteaders. The land wasn’t available to *anybody* who was willing to move west and try to make do, it was available to white people who wanted to live the fabled American dream. For people who are descendants of slave such as myself, this was not an option for me. The closest we could come to this was sharecropping which was just glorified slavery. So please don’t whitewash history, it’s disingenuous and offending to your non-white fans. The 1866 Homestead Act was open to African Americans as well.